EUGENE, Ore. – Dec. 3, 2018 -To perform a song, a dance or write computer code, people need to call upon the basic elements of their craft and then order and recombine them in creative ways. University of Oregon scientists have captured how the brain builds such complex sequences from a small set of basic elements. Doctoral student Atsushi Kikumoto and Ulrich Mayr, a professor in the Department of Psychology, detailed their National Science Foundation-supported work in a paper published online Nov. 14 in the journal eLife. In the study, electrical activity and oscillation patterns were measured by electroencephalogram, with electrodes on the scalp from 88 study participants, all university students, while they performed complex, sequential patterns. “Basic elements – the alphabet of any type of performance — need to be combined in a certain order within larger chunks, and these chunks, in turn, need to be combined in a certain order to arrive at the complete sequence,” said Mayr, who directs the UO’s Cognitive Dynamics Lab. “This is at the heart of a lot of human creativity. Subjects memorized sequential patterns that consisted of three different angles of lines as basic elements. When participants subsequently tried to reconstruct the succession of lines, the EEG showed oscillatory patterns that Kikumoto and Mayr decoded using machine learning techniques. It turns out that the EEG patterns kept track of the precise location within the sequence – which chunk, which position within the chunk, and which line angle people were focusing on. The findings from the basic research help to understand why some people have difficulties with executing complex sequential plans, Mayr said. Within the hierarchically organized addressing system, not everyone showed a robust EEG expression of the more abstract levels, he said. Only people with strong working memory scores – a reflection of the capacity of an individual’s mental workspace – seemed to have a crisp record of the current chunk. “Without the chunk information they literally got lost within the mental landscape of the overall sequence,” he said. EEG allowed the researchers to capture electrical signaling in the brain in real time. 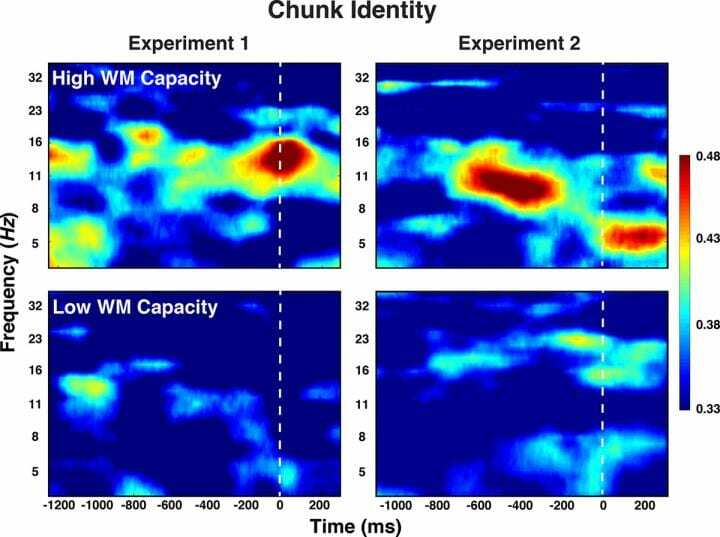 Mayr and Kikumoto are now working to complement the findings with magnetic resonance imaging to document exactly where in the brain the sequential addressing system is localized.